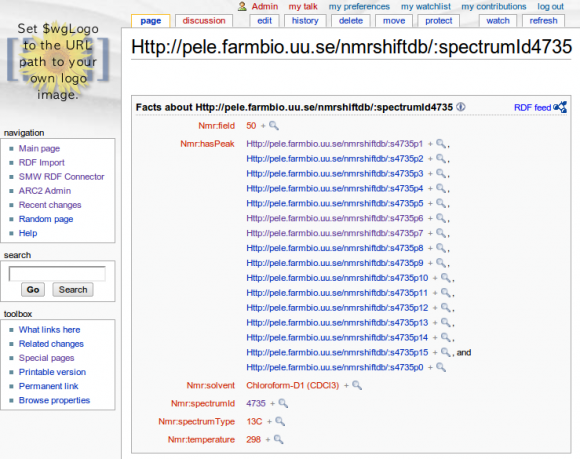 What will happen when submitting the form in the screenshot is; if I click only "Output Equivalent URIs", then both of the above facts will be exported, but by enabling "Filter by Vocabulary" and setting the URL to FOAF:s definition file, the export will be filtered to only contain the first fact, which is included in the FOAF definition. For RDF export, implement an "export by ontology" option, that - when possible - restricts the URIs used for a wiki page to only those that appears in an ontology that the user points to. Create an HTML interface for interactively configureing how wiki titles should be chosen for RDF entities for which no preferred "wiki title property" (such as rdfs:label, dc:title etc.) was found. Add "pseudo namespaces" as an option for choosing wiki titles from general RDF URIs (not only properties!). I.e, the possibility to abbreviate a part of an URI into a pseudo-namespace, making the URI more fit for use as wiki title. (For properties, there if often a well known abbreviation for the corresponding vocabulary/ontology's base URI, but this is often not the case for general RDF entities, which can often be from some user defined data etc). Implement filter by "export rdf" property. Just to inform that I created a new release of the RDFIO MediaWiki extension. It contains important security fixes, by adding at least some basic checking of user rights and CSRFs (Cross site request forgeries) to the SPARQL endpoint, RDF import form etc. Thus, it's highly recommended to upgrade if you are using the extension on a public wiki! There are also some extra additions that I'll look into if time permits, like adding support for filtering the output on export with a property such as "RDF export::False", as suggested by Daniel Herzig. 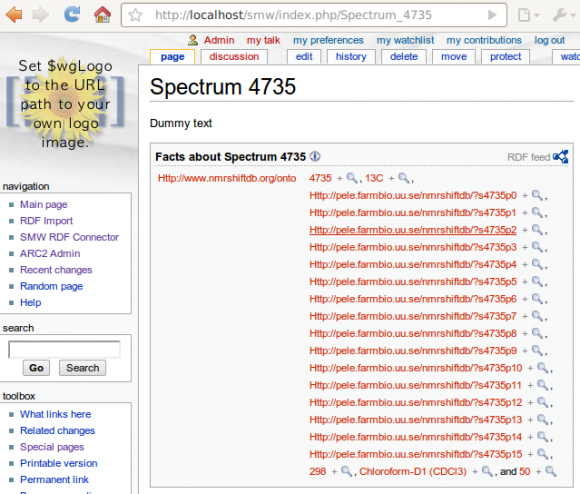 In a previous blog post I demonstrated with a screen cast the RDFIO extension for Semantic MediaWiki but nothing on installation. 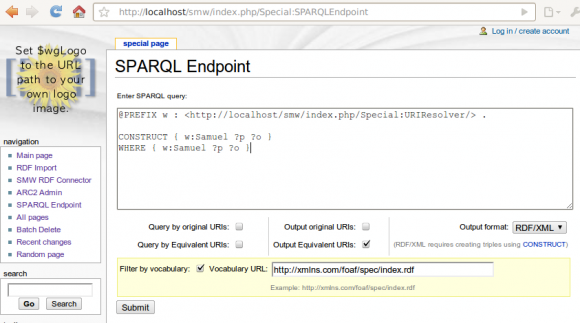 The screencast shows how you can import RDF/XML into Semantic MediaWiki and then use the SPARQL endpoint to insert or remove data to/from articles, even using the original format of the RDF that you imported earlier. I have since worked a bit on some use cases, which revealed a lot of intricacies to take into account on RDF import. One of them was a spinoff discussion, from a blog post by Egon Willighagen, which quite nicely outlines one of the motivations for having general RDF import in MediaWiki (read post, read discussion). The RDF import seems to be the most challenging part in my project (and on which the export feature heavily depends) - since it is the part where I'm breaking a bit of new ground, so here feedback is much welcome. The one most challenging issue is about how to select reasonable wikititles to use for RDF entities on RDF import, based on the RDF data (one relevant blog post here). The question of being able to export the page with the original URI, should not limit the choice directly, since this is already solved by storing the original URI as a property on each page. First look if the RDF entity in question has one of a list of properties, in prioritized order, that should be used as wiki title. The first of these, could be a special property which can be used to manually specify this by including it in the imported RDF, like "hasWikiTitle". The suggested list or properties so far can be seen in this blog post. This list should of course be configurable, and one question is also how to best implement this configuration? 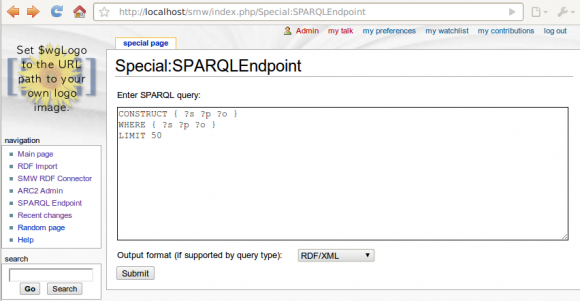 A setting in LocalSettings.php? A wiki page? If no matching property is in this list, then the label for the RDF entity should be used. For example, if the entity:s URI is http://bio2rdf.org/go:0032283, then 0032283 is used. How to configure namespace prefixes / preudo-namespaces? Using only the label of course has the risk that multiple RDF entities converts to the same wiki title, which is not acceptable for example if using the wiki as a "one time RDF editor", which is one of the motivations for this project. To solve this, one alternative (as a configurable option) could be to use a pseudo-namespace in the wiki title (e.g. "go" in the above example, which would result in "go:0032283" as the wikititle). This could be configured by creating a mapping between base URI:s and pseudo-namespaces (.e. "http://bio2rdf.org/go:" and "go", in this case). Let it be configured in the incoming RDF, by using a custom predicate "hasPseudoNameSpace"
On submitting data for import, analyze it first and present a screen with all the base URI:s used, with fields to manually fill in the pseudo-prefixes to use. RDF properties to use for wiki titles on import - suggestions? One of the things we try to do in my GSoC project is to select suitable wiki titles when importing arbitrary RDF triples into Semantic MediaWiki (The full RDF URI:s are very ugly to use as wiki titles!). Code is still quite ugly and the "Equivalent URI" handling that we talked about is still not implemented. Will turn to that now, while doing some refactoring (more object oriented etc). Imports will have to be done according to a special "mapping configuration", so that the same config can be used on import and export, if wanted. Such a config should be generated on import based on the RDF namespaces used. It should also be manually expandable with a prioritized list of properties (like dc:title) to use as substitute for URIs. Maybe it could be stored in a (timestamped?) wiki article? When using "natural language" substitutes for URI:s, such as "dc:title", one has to put a property such as swivt:originalURI or similar into the page, so that it can be exported again with its original URI (or there is already the swivt:importedFrom (or sth like that...) ... is it better to use that? As you might have seen in my previous blog post, using the full RDF URI:s as wiki titles on importing, is not optimal. I now managed to use the RDF namespace prefixes submitted on import time, to make titles nicer. Definitely improves things a bit. At least all properties are not all treated as the same as in the previous blog post for example. But, also still a bit to go. Not all URI:s have prefixes, and for some things you would probably want to use the corresponding dc:title or similar instead of an abbreviated URI, etc. I now managed, (using ARC2 and SMWWriter, in a MediaWiki extension) to populate Semantic MediaWiki pages with triples, from a snippet of RDF/XML (Thanks to Egon Willighagen for the RDF-ized NMRShiftDB data, submitted further below), yay! But ... as you can see, using the full URI:s as wiki names is not a good idea. URI:s as wiki titles is ugly ... and the predicates in this case even got truncated and all treated as the same one, since they had hashes in it, which MediaWiki obviously doesn't allow in titles), so that's the whole background for our talking so much about the "equivalent URI handler" (mentioned here for example), which is thought to be a configurable handler of mappings from URI patterns to (sensible) wiki titles. Also, optimally the same pattern can then be used both on import and export so that the format is kept, allowing to use SMW as a (collaborative) RDF editor! (which is one of the main motivations for my GSoC project).